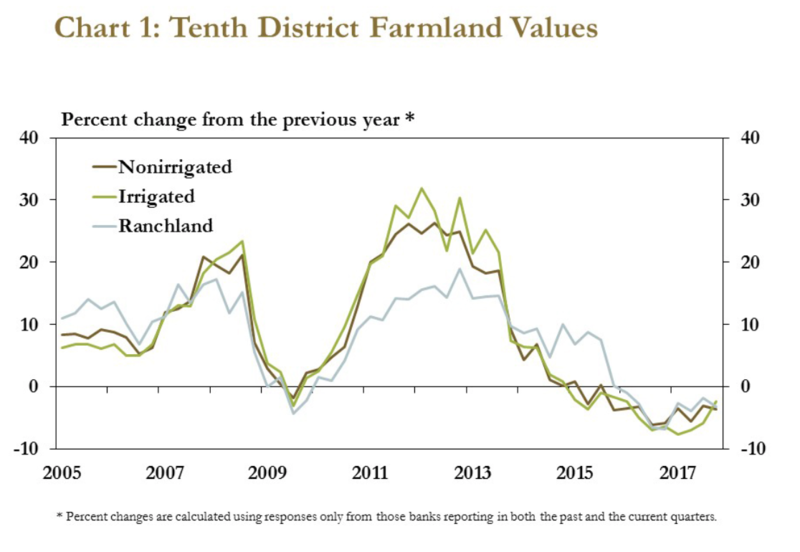 * Seventh District- Chicago– “Expectations for overall farm income in 2018 improved somewhat in January and early February, though much of the District’s farm sector remained under stress. There were reports of more small tracts of ground being offered for sale. 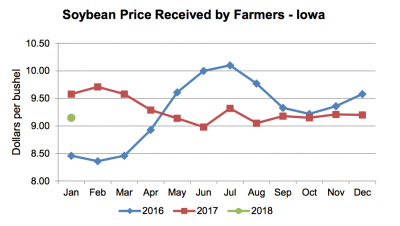 Corn and soybean prices were up enough to cover a slight rise in projected production costs for 2018. 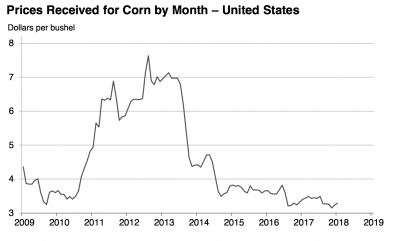 Agricultural Prices. USDA- National Agricultural Statistics Service (February 27, 2018). 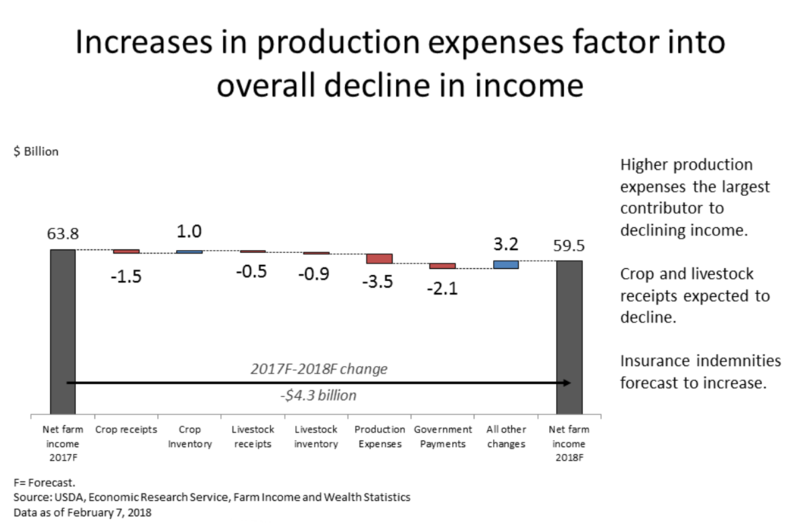 USDA- Economic Research Service Webinar, “Farm Income and Financial Forecasts, February 2018 Update.” (February 7, 2018). 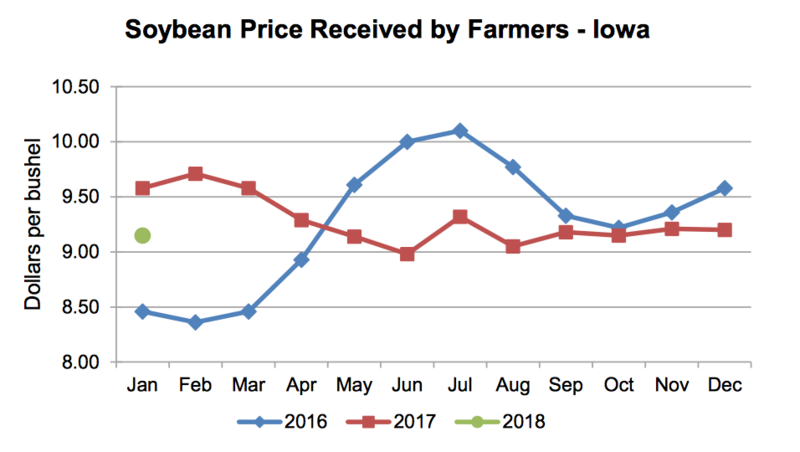 “Iowa Ag News – Monthly Prices,” Upper Midwest Regional Field Office. USDA- National Agricultural Statistics Service (February 27, 2018). * Eighth District- St. Louis– “District agriculture conditions have improved slightly since the previous reporting period. In spite of concerns about low temperatures in early January, the percent of District winter wheat rated fair or better ticked up about a percentage point from the end of December to the end of January. Contacts expressed optimism about near-term farm income as area farmers were able to turn strong yields into profits in 2017, although some expressed concern about the downside risks of NAFTA renegotiations. 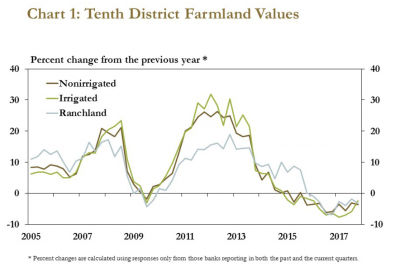 * Tenth District- Kansas City– “The Tenth District farm economy remained weak, but farm real estate values slowed their decline from the previous months, providing some stability for farm finances. Graph from the Federal Reserve Bank of Kansas City, Ag Credit Survey (February 2018). 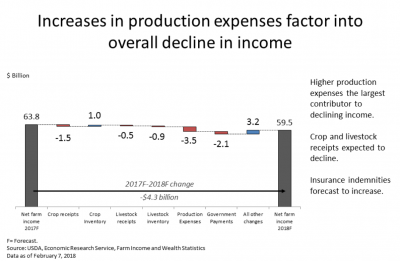 Farm income continued to decrease. 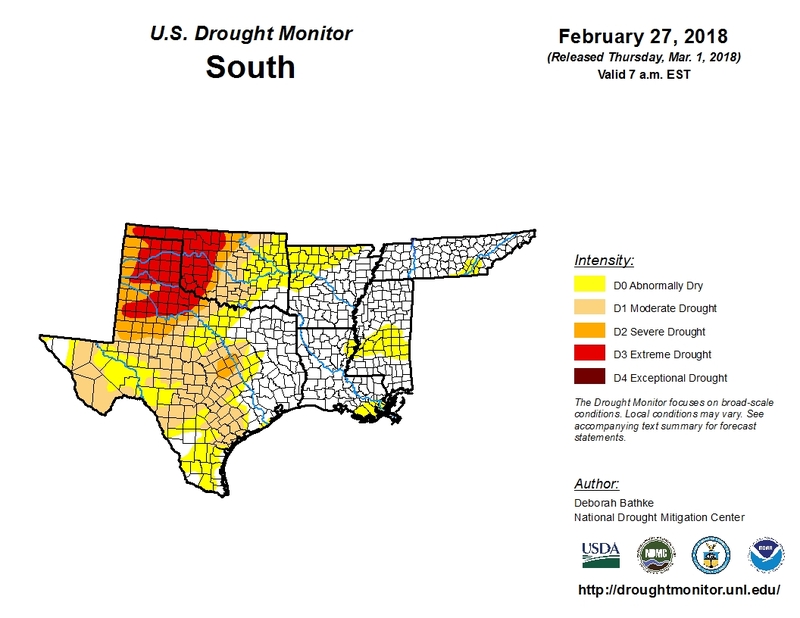 * Eleventh District- Dallas– “Agricultural producers were concerned about worsening drought conditions. As of February 20, 70 percent of Texas was experiencing at least moderate drought, with some extreme drought in the High Plains and Panhandle. U.S. Drought Monitor. (March 1, 2018– Data valid: February 27, 2018 at 7 a.m. EST). “However, rainstorms late in the reporting period likely alleviated the dry conditions in parts of the state. The cattle sector remained solid with strong demand for beef, both domestic and international, and rising cattle prices. However, the dairy industry continued to struggle with declining prices. Cotton acreage will likely be up in Texas this year, and there was excitement among producers about cotton provisions being added back into the Farm Bill legislation.